As the son of a long-standing Warrenpoint Golf Club member, Nigel Shaw was headed for a career in banking before the years of varied summer jobs at the golf course gave him a chance to take over as the club’s assistant professional. Now, after more than 30 years as Head Professional, he has no regrets. Nigel’s fitting sessions start off with a basic check on the lie and length of your clubs. Once you have tested different club head and shaft variations on the Flightscope launch monitor, he will discuss the options which will lead you to your best performing club. Nigel has all of the required equipment and expertise to provide you with the best information about your game. Nigel’s customers benefit greatly from his knowledge of the game. They come to him because he tells them the truth about their skills including their swing and through state-of-the-art technology can quickly identify areas that can be improved. 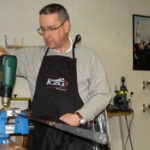 His expertise has earned him the honor of being named one of the World’s Top 100 Clubfitters for the last four years (2015-2018). Let Nigel help you lower your score from the benefit of teaching solid game skills and providing the right clubs to suit your pocket and skill level. Nigel is part of a small group of club builders who handcrafted persimmon woods so you know that attention to detail is very important to him. All handicap level players are welcome to visit Nigel and see how he can help with your game. The proof is in the pudding and Nigel gets results that validate his expertise.